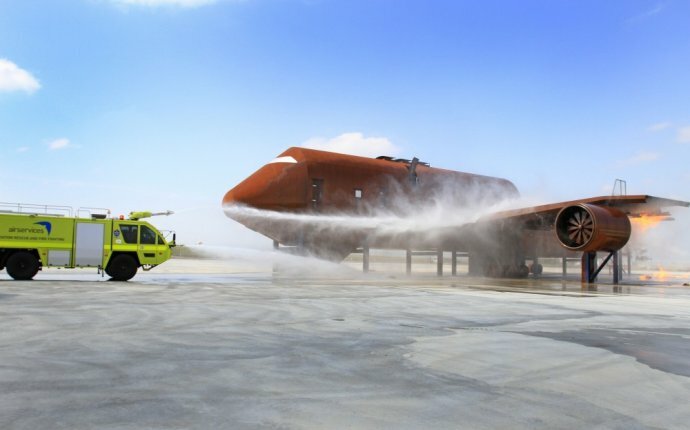 The South Carolina Fire Academy's Aircraft Rescue Firefighting Program (ARFF) is accredited by the International Fire Service Accreditation Congress (IFSAC). This international group is made up of entities from the United States, Canada, Great Britain, Australia, and South Africa. Accreditation guarantees that the Fire Academy certification program has been carefully reviewed by a group of fire service professionals, and that it meets national and international standards. The South Carolina Fire Academy is an FAA Regional ARFF fire training center. This five-day/ 40 hour international certification course provides skills necessary to perform aircraft rescue firefighting duties (NFPA 1003). ARFF firefighters will fight live flammable liquid fires with hands-on foam application and tactics. Classroom presentations include: FAA rules and regulations, airport certification, aircraft and airport familiarization, ARFF safety, ARFF apparatus, PPE, rescue and firefighting procedures, tactical operations, hazardous materials, incident command, airfield communications, extinguishing agents, ARFF tools and equipment, and airport emergency plans. Practical sessions include: Forcible entry and disentanglement, laddering operations, live wheel/brake, engine, nacelle, galley and cabin fires, victim extrication, ventilation procedures, triage, RIT, flammable liquids foam firefighting, three-dimensional dry chemical firefighting, and ARFF apparatus live fire turret operations. The South Carolina Fire Academy’s ARFF instructor team has the ability to customize training to meet your ARFF department’s needs. We utilize four ARFF apparatus, two 737 aircraft fire trainers, flammable liquids props, and a piercing prop for departments that have or may want training on HRET (high reach extendable turret) systems with piercing tips.